Walker’s Game Ear, the shooting and hunting industry pioneer in hearing protection, introduces their new HD Pro Elite, 20% smaller in size and built for the hunter. 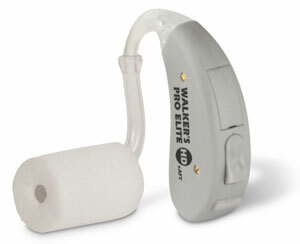 The Walker’s Game Ear HD Pro Elite’s four digital sound processing channels provide crisp, clear audio without outside interference. The 20 bit audio processor allows for exceptionally clean and precise sound. An automatic feedback control helps eliminate unwanted feedback. Equipped with one environmental adaptive listing mode to distinguish animal sounds, the HD Pro Elite also features an 8 band graphic equalizer that gives the audio that rich, full, wide-band quality and also boasts an adjustable frequency tuner for bass/treble fine tuning. The HD Pro Elite has 50 db of enhancement so you can get an outstandingly clear, crisp sound while the 29dB NRR protects the users hearing. A toggle volume control gives the user the power to adjust the volume based on the environment they are in. Fast acting sound compression quickly represses any noise that could harm the user’s ears. Low battery tone indicator tells the user when their battery is low.